When you are in the business of letting retail space, you want all elements of your offering to look good at all times, to help you both attract tenants and retain their custom over an extended period of time. This not only applies to the inside of any office or shop space you are letting, but also to the surrounding outdoor area. When we arrive at business parks, out of town retail spaces or even high street store units, we like to see a clean, litter free space and, where appropriate, grassed areas and flowers adding an element of colour. Anything less than that can be severely off-putting, which is why here at Ricky Tyler Landscapes, we offer a range of services for those managing business spaces. 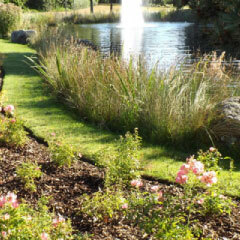 We help keep your grounds in the best shape possible, and make maintenance easy and stress-free. The range of services that our specialist grounds maintenance teams regularly undertake include grass cutting, litter picking, street cleansing, maintaining hedges and bushes, spraying and waste removal - ensuring your space is left looking its best. When our teams are on-site, they are easily recognisable with our company name on the back of their uniforms and they work quickly and efficiently, so you need not worry about any disruption while they carry out the work required. Tailored packages can be put together depending on the needs of your individual site, and we can also put together larger packages designed for multiple spaces. To see how Ricky Tyler Landscapes can help your business space look the best it can all year round, give us a call on 01707 324 262 to talk through your specific needs or use the contact form to the right and one of our team will get back to you as soon as possible. 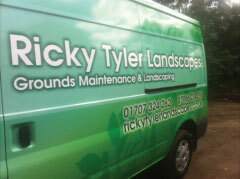 Ricky Tyler Landscapes can provide gardening and grounds maintenance services including Retail Park Grounds Maintenance covering London, Essex, Hertfordshire, Northampton, Buckinginghamshire & Bedfordshire .